When the Coast Guard came into being in 1915, through the consolidation of the Revenue Cuuter Service and the Life Saving Service, tugs made up a small but significant portion of the new service’s fleet. 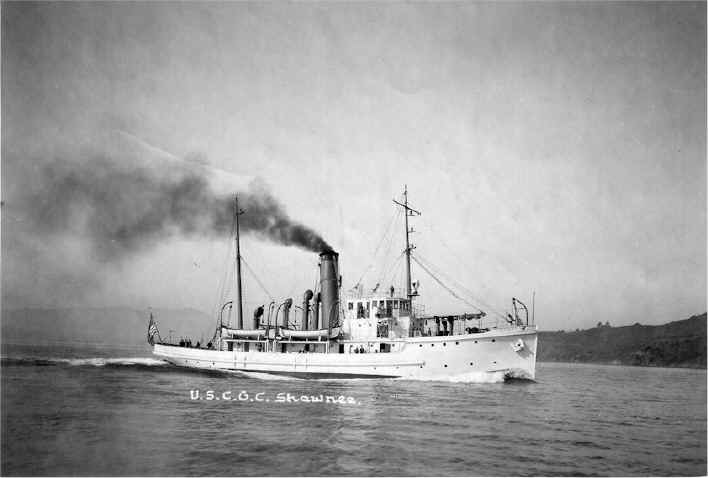 The Acushnet and Snohomish were the two ocean going tugs of the Coast Guard. The former served in the Atlantic and the latter in the Pacific. 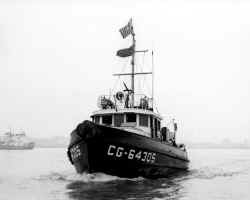 There were also 17 vessels classified as Harbor Cutters and Launches and these vessels, with a few exceptions, were the first US Coast Guard Tugs. 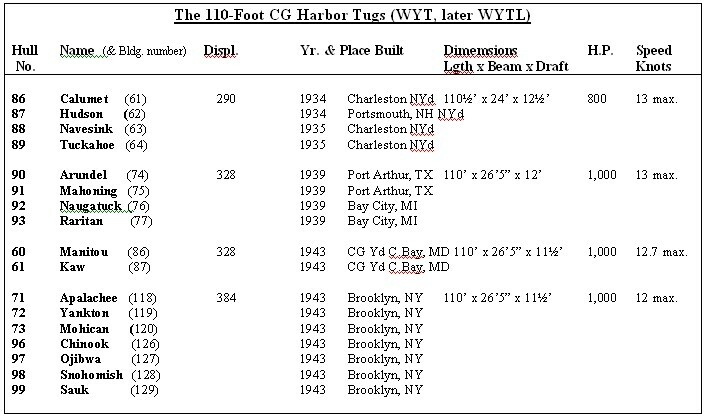 While few who read this may be really interested in this early history of CG tugs, I have included the table below listing these vessels and some pertinent data on them. 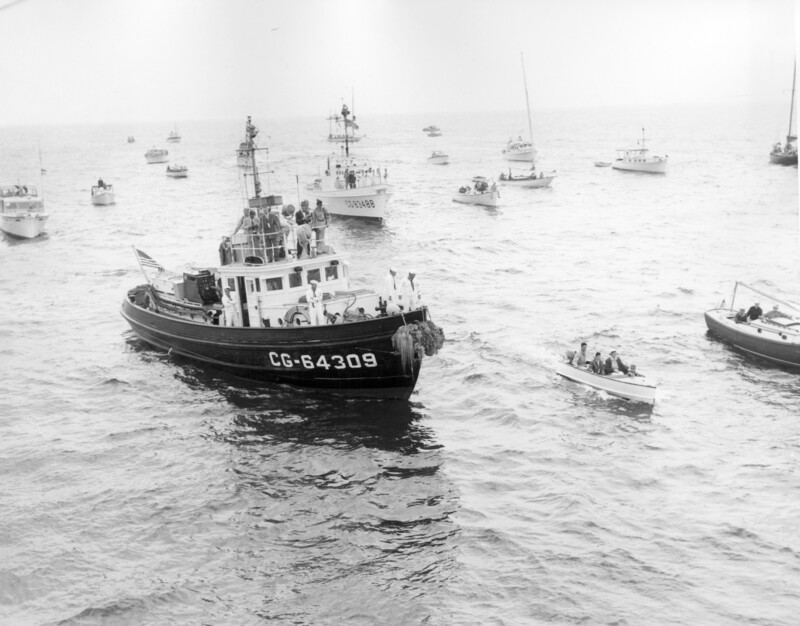 This has been done in the interest of providing a more complete historical picture of the US Coast Guard and her Tugs and because little has been recorded about them compared to their big sisters the Cruising Cutters. All these vessels were steam powered originally but the surviving harbor launches were converted to gasoline or diesel power by the 1920’s. 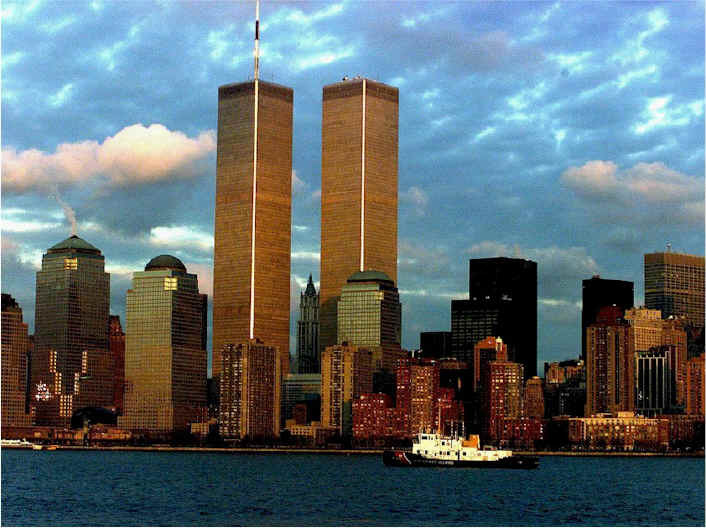 Sturgeon Bay WTGB-109, passing the World Trade Center , before 9-11. 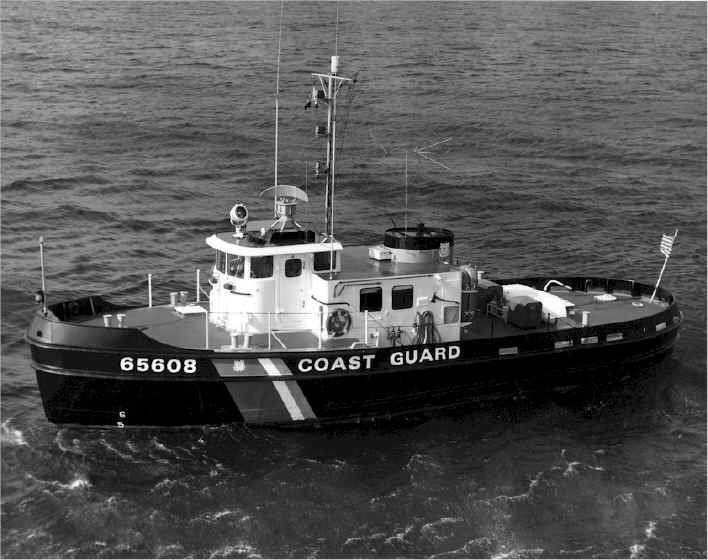 From 1915 until the merger of the Lighthouse Service with the Coast Guard in 1939, the major events which affected the Coast Guard fleet in general and the Tug population in particular, were World War I and the advent of Prohibition. World War I saw the CG population grow to triple its peace time number of personnel. 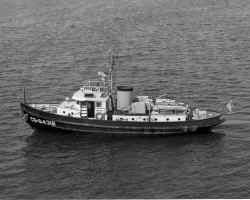 New construction and other acquisitions of tugs saw the tug fleet grow to include a small number of tug like craft classified as Anchorage and Boarding boats (AB’s) as well as 10 former US Navy 88-foot steam tugs. These USN tugs were acquired in 1919 and 1920 and served the CG for varying periods from about 2 years to over 15 years. These tugs displaced 215 tons and were 88’x 20’x8’9” and little has been written about them. They were all named for rivers and below are a listing of these vessels with some limited data on them. The Volstead Act became the law of the land in 1920 when the 36th state ratified the 18th Amendment to the Constitution. 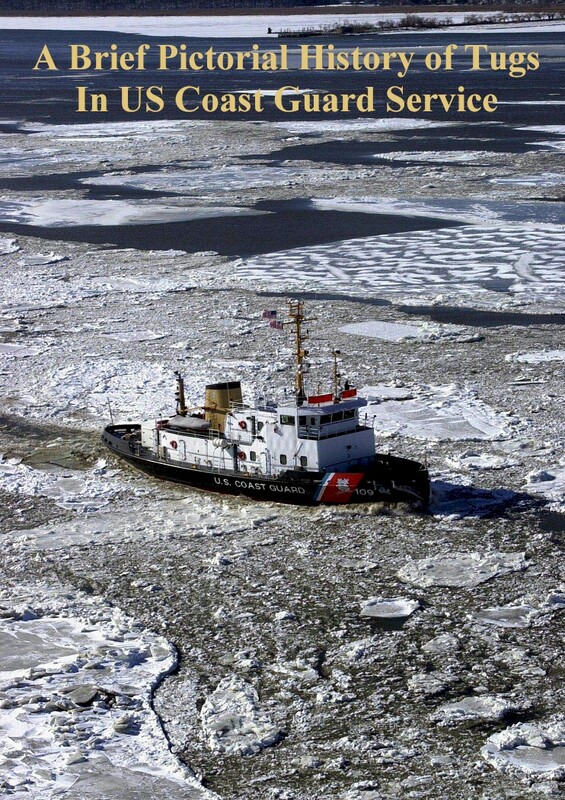 The Coast Guard’s reaction to the new law was cautious and methodical. In terms of shipbuilding and acquisition of vessels things progressed as before until about 1924 when an enforcement push caused a surge of activity in these arenas. True to form additional tugs were part of the mix. In 1921 the tug Raritan was acquired from the Dept. of Labor. She was 103-feet long and displaced 220 tons. She served until stricken in 1939. That same year in October, three ex. U. S. Shipping Board (USSB) tugs were acquired. They were 151’ 3½” in length and displaced a robust 869 tons. Named Mascoutin, Saukee and Tamaroa, all served into the mid 1930’s. 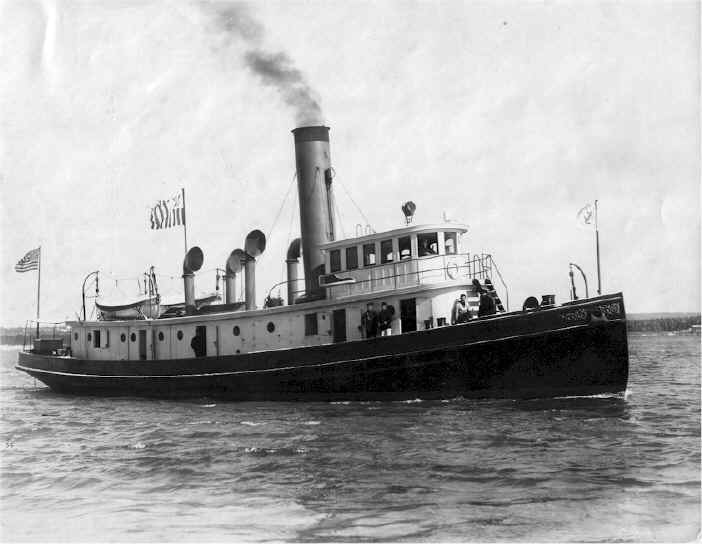 Cable Layer Pequot (later WARC-58) was built for the US Army and acquired by the CG in May 1922. She was built to a tug like design, although she spent almost all of her career, which lasted until the end of WW II, in her intended role laying cable for the CG and later for the US Navy. 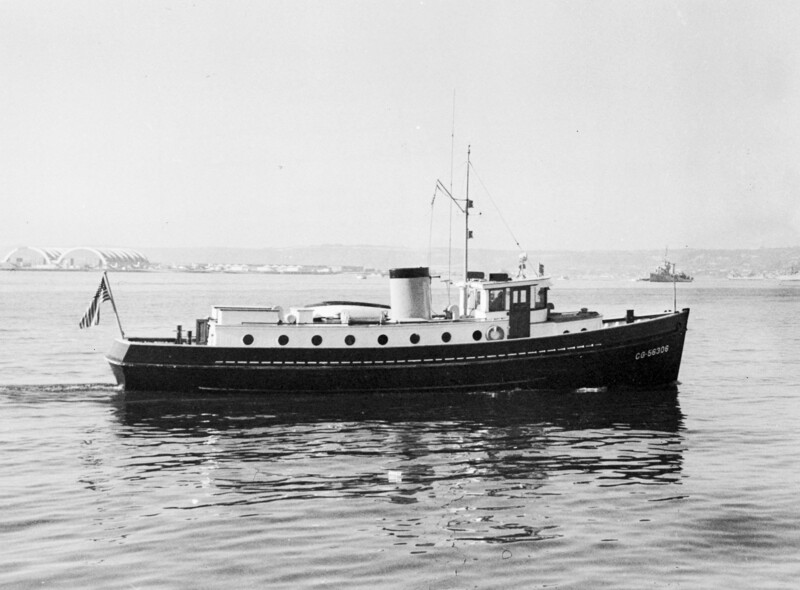 Tug Shawnee (later WAT-54) was commissioned on 8 March 1922 and served on the West Coast through WW II. She was 158’ 3” in length and displaced 900 tons. She was of composite construction – wood and steel. 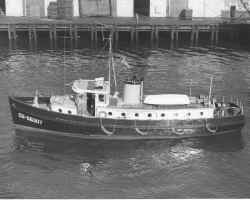 Then in 1924 the US Navy Tug Carrabasset (ex. AT-35, later WAT-55) joined the Coast Guard and served up and down the East Coast until the end of WW II. She was a heavy weight, displacing 1,133 tons and was 155’ 9¾” long. 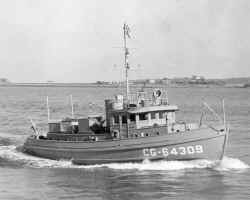 That same year the former USN Bird Class minesweeper Redwing AM-48 was commissioned into the CG and served until returned to the Navy in 1941. 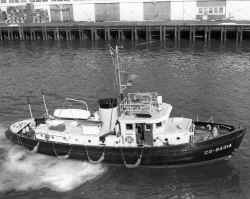 Another USSB tug the Leopard came aboard in 1926. At 176 tons and 94’ in length she was of medium size and could make about 12 knots. She served until 1935 when she was sold. She spent much of her CG career at the Yard in Curtis Bay, MD and was listed as 110 feet in length later in her tenure. Thus she probably received some alterations to her wooden hull during her CG service. 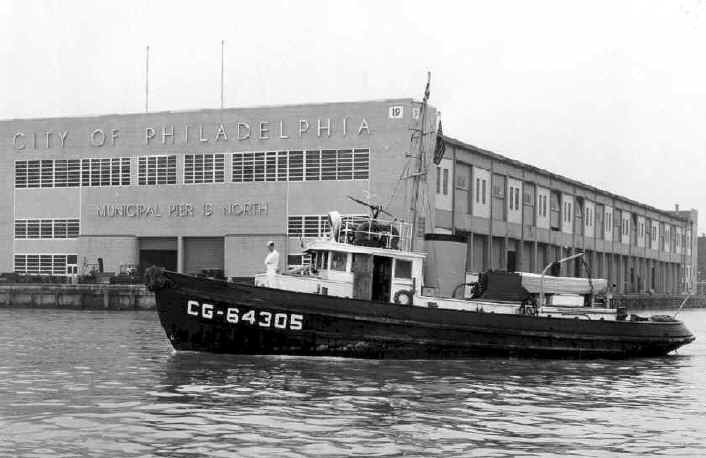 The 1930’s saw the beginning of the building program which was the genesis of the “modern” Coast Guard harbor tug. 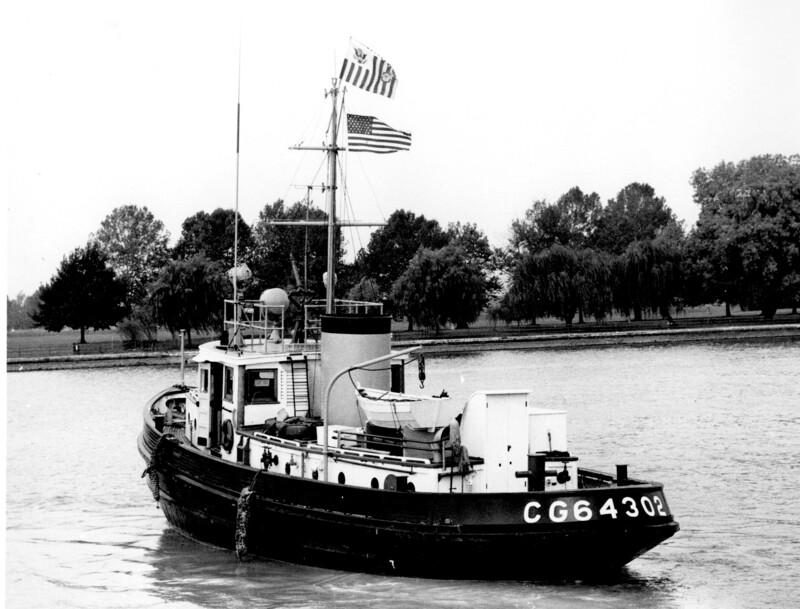 Commissioned in 1934 and 1935 were the four diesel powered 110-foot Tugs of the Calumet class. 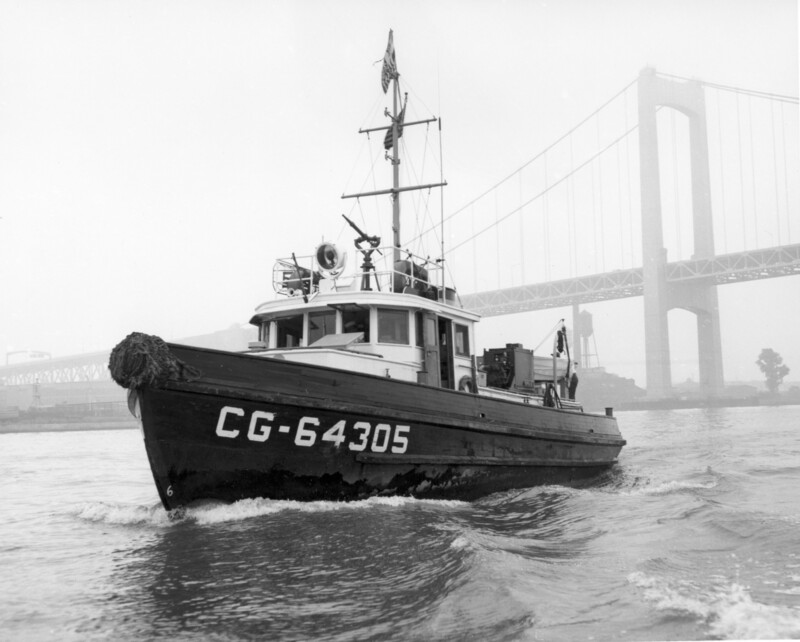 These four ships are prototypical of the 110-foot CG harbor tugs which many of the CG Tug Association members served on. They served well into the 1960’s and some are still in service in civilian roles today. 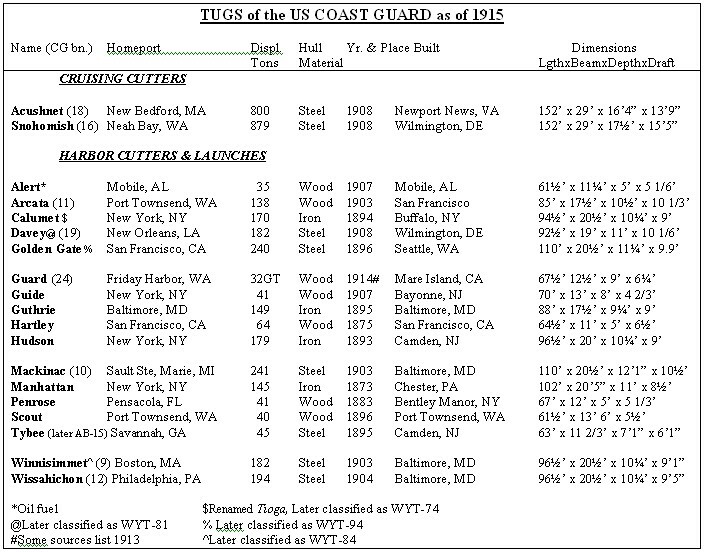 A table of all of the 110-foot CG tugs will follow later in this document. Four more 110-footers, the Raritan class commissioned in 1939 and served until the late 1970’s and early 1980’s. They were nearly identical to their predecessors except for their machinery arrangements. Two 110-footers followed, commissioning in February and March of 1943. They were the Manitou WYT-60 and the KAW WYT-61 and seven more 110-footers commissioned during WW II, in late 1943 and early 1944. 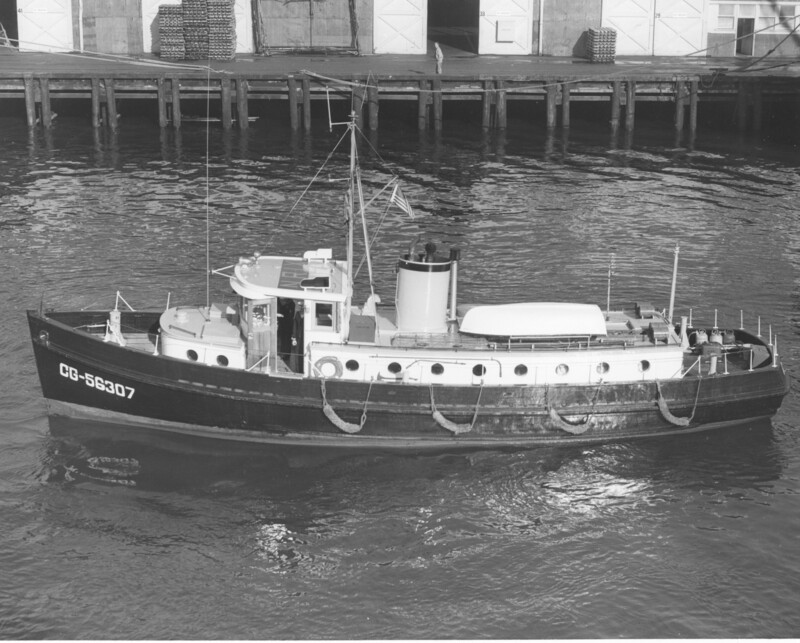 These were the Apalachee class which added additional ice resistance and ice breaking features (for their intended duty in the Greenland Theater) as well as fire fighting monitors, to the earlier designs. 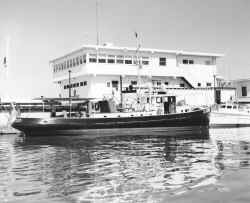 Thus there were 17 of these hearty 110-footers, the last of which served until 1989, a span of half a century. 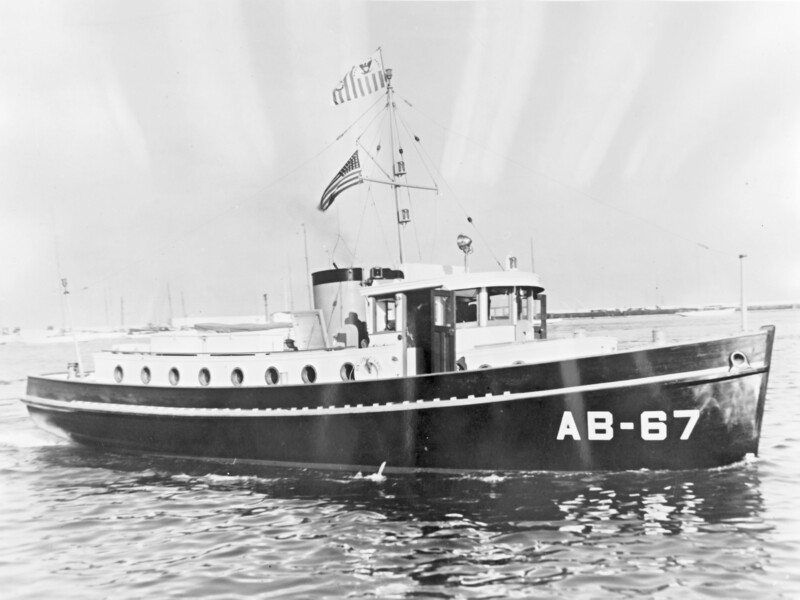 A 63-foot class of tugs was built at Neponset , MA in 1936. 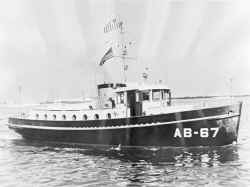 Originally called AB-25 and 26 they were later numbered CG-63300 and 63301. 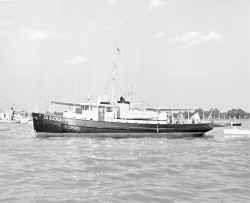 They had wooden hulls, displaced 69 tons and made 11 knots, powered by 300 H.P. diesels. 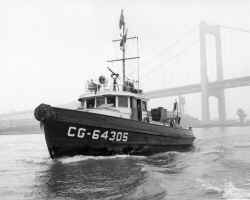 CG-56300 through 56307 were the former AB-61 through 68 and were built in 1936 to 1937 in Brooklyn , NY . 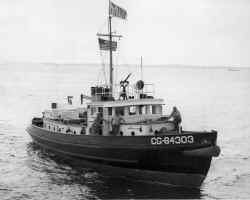 Their wooden hulls were 56 feet long, displaced 32 tons and they made 10 knots, powered by a 150 H.P diesel. During late 1943 through 1944 a total of 15 64-foot wooden hulled harbor tugs were built for the Coast Guard. The first 12 were built in NY and the last 3 in Sausalito , CA . They were 64’11” x 18½’ x 6½’ with a displacement of 65 tons. They made 11 kts. and were powered by a 160 H.P diesel engine. They served well into the 1960’s but were all disposed of by the early 1970’s. 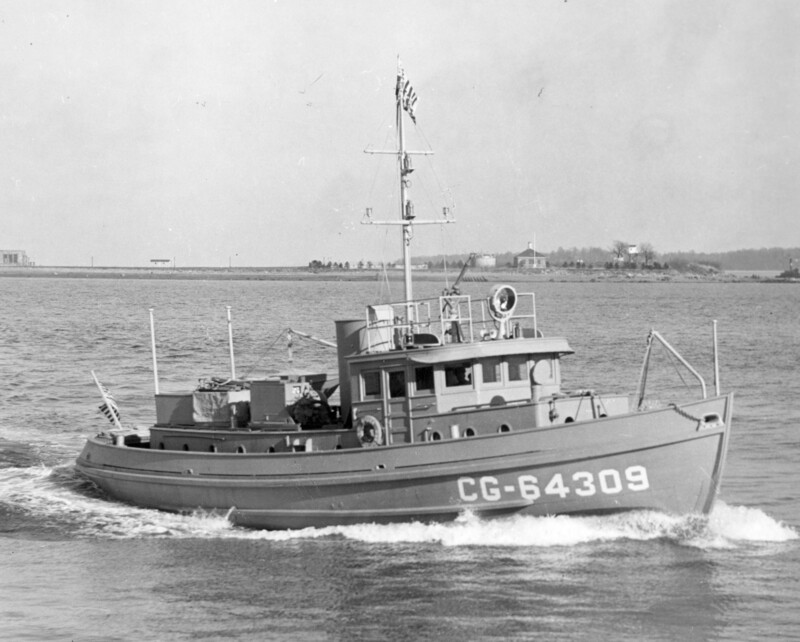 They were too small to be officially classified as cutters and thus were never named, but were numbered CG-64300 through 64314. In 1945 a US Army harbor tug, ST-710, was acquired for duty at the Coast Guard Yard in Curtis Bay . She was named the Messenger CG-85009 and served there until the 1980’s. 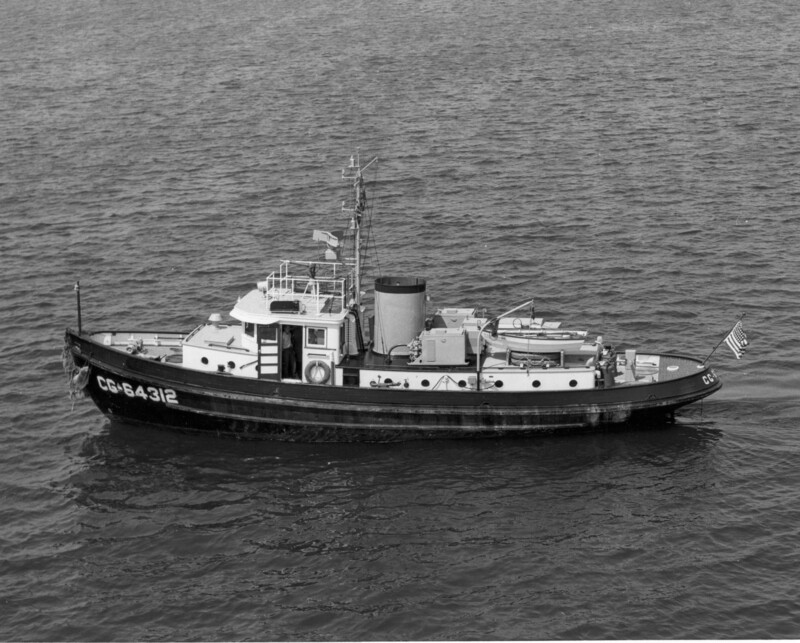 Another Army tug TD-42 was named Research CG-85010 and served briefly around 1973 before being transferred to the State of Alabama Civil Defense . 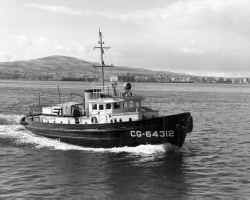 Then in 1949 a Navy tug Yonaguska YT-195 (she became WYT-195) was acquired for use in Honolulu and was in service there until returned to the Navy in 1954. Beginning in the immediate post WW II period a number of former US Navy sea going tugs and salvage vessels were taken into service by the Coast Guard. 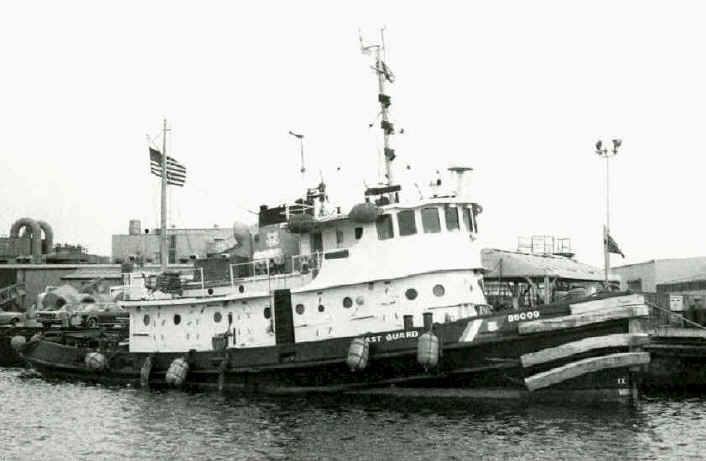 First came two former Fleet Tugs of the Navajo class. These were just the first two of six sisters of this numerous class of 205-foot steel work horse tugs to find their way into CG service. The other 4 would come into CG service later on. They were acquired in pairs in 1956 and 1980. 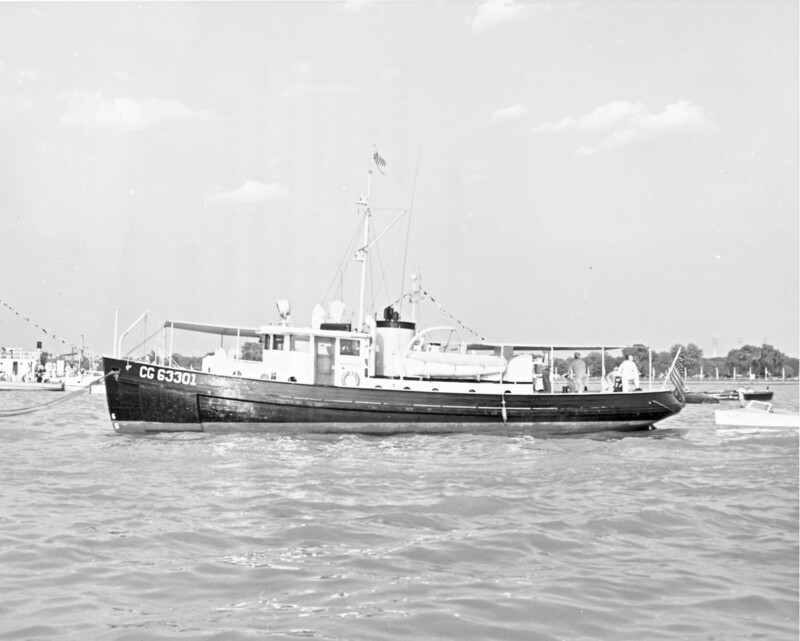 At about the same time, right after the war (1946) two 213-foot Diver class salvage ships were also taken into CG service and would be joined by a 3rd sister ship in 1980. 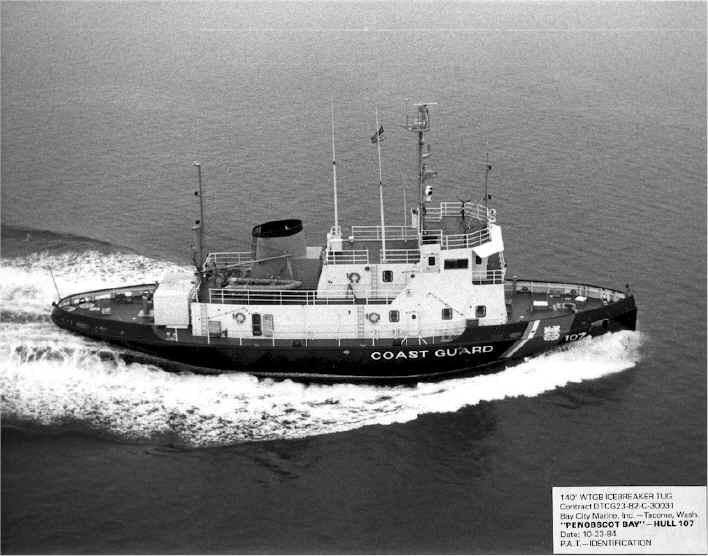 Finally in 1959 two 143-foot former USN ATA’s (originally built as ATR’s) were commissioned in the Coast Guard. 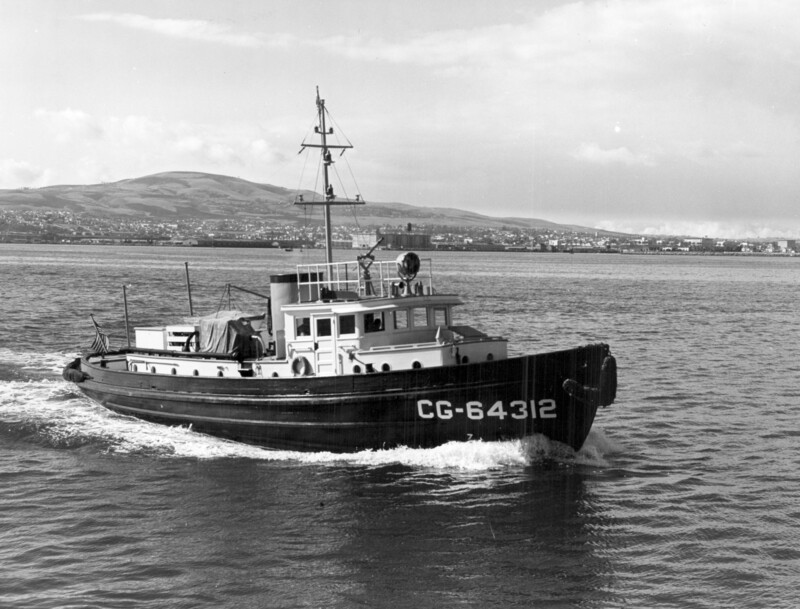 They were the last type of former Navy tugs to be acquired and would serve until 1979 and 1980. 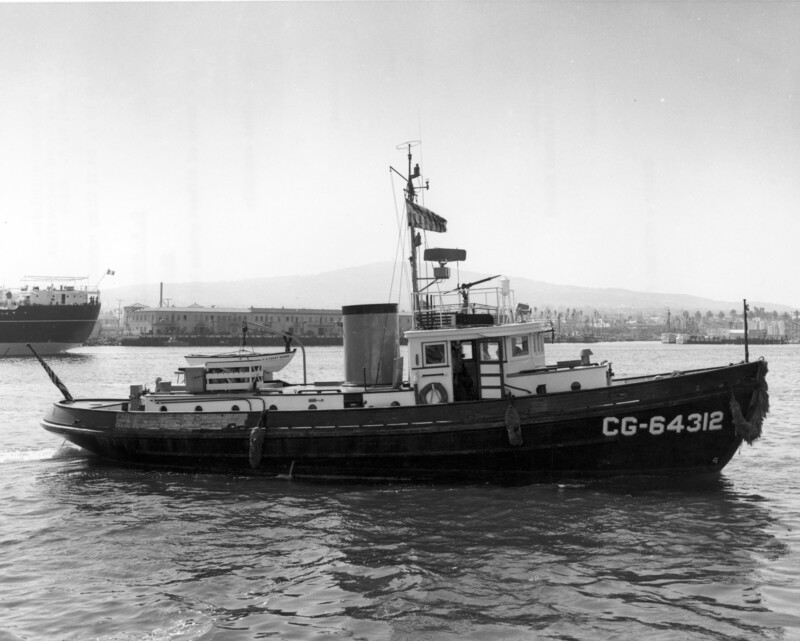 The next large class of CG tugs are the 65-footers of the Capstan class. Fifteen in all were built by three different yards in Jacksonville , FL ; New Bern , NC and Tacoma , WA . They were commissioned between 1961 and 1967 and many of them are still in service today, a testament to their robust nature. They are steel hulled and replaced the wooden 64-footers. As built the first dozen carried numbers only and were not named until around 1965. They do quite well with light ice breaking, Search & Rescue and Law Enforcement duties. Originally stationed on both coasts, today they all are stationed on the East Coast, in cold weather ports, and are all reaching the end of their useful lives. Five have been decommissioned already, and others are certain to follow, as they all approach the 45 year mark in their service careers. Finally we have probably the most familiar class of CG Tugs in service today, the 140-foot Bay class WTGB icebreaking tugs. While all were built at Tacoma , WA , none remained on the West Coast for long. 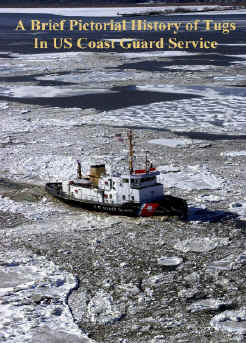 Instead they are all stationed in the Great Lakes and in Northeastern cold weather ports. 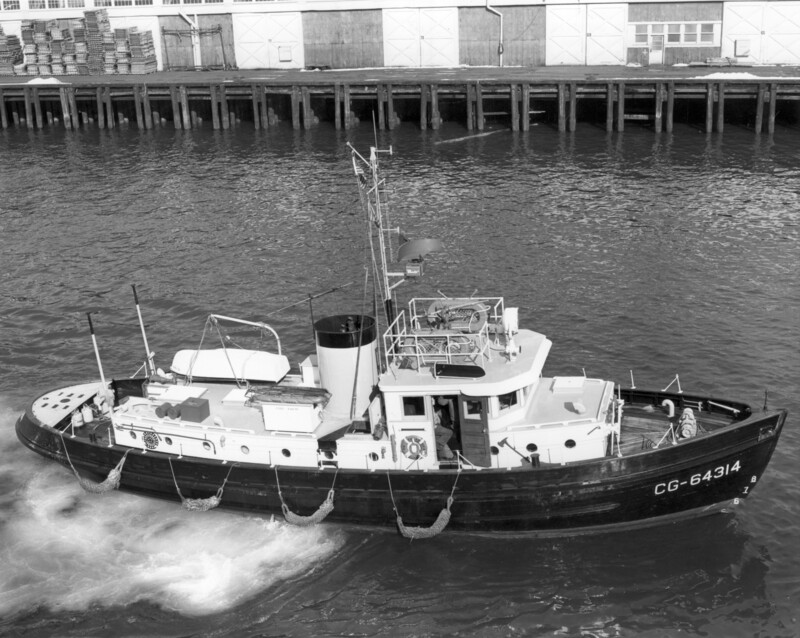 In the warm weather months some are often employed as buoy tenders with ATON barges. They entered service from 1979 through 1988 and are expected to continue in service for at least another decade.